How I Went From an ER Doc to an Internet Entrepreneur | Passive Income M.D. 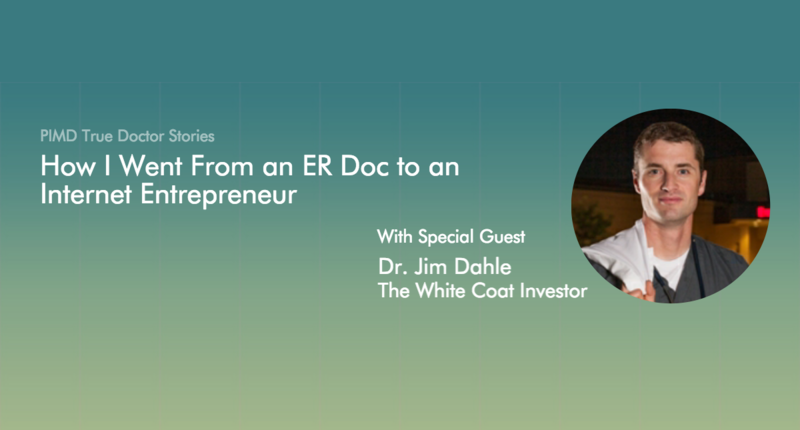 Why did you create the White Coat Investor? What was your motivation? I had two motivations. The first was to fulfill a huge need that I saw – an abysmal lack of financial literacy among doctors. Physician debt levels were rapidly climbing, and physician reimbursement for many specialties was flat or even falling. These were creating a norm where doctors were not financially secure and never would be. After repeatedly getting ripped off due to a lack of financial literacy, I began the self-education process. I learned that the personal finance and investing information doctors needed was far easier to learn than medicine. Nobody was teaching it in medical school or residency, so I wanted to get that information out to as many physicians as I could. I spent several months talking to bloggers about what it would take to blog professionally – to build a following and make some money. And so I knew exactly what I was in for when I started the blog – years of work without any definite promise of financial success. The second motivation was an interest in developing a passive income [stream]. The White Coat Investor was a for-profit business from day one. I had ads up on the site within a few days of writing my first post. I set the goal to be making $1000 a month within 2 years of starting or I would quit. I barely made that goal. The hourly rate on the time I put in those first two years would be abysmal. The internet is the Wild West of entrepreneurship and I found it really exciting to learn how it really worked and how the website could be scaled up to reach people all over the planet. How much time are you putting into running the business? I’m inspired by Tim Ferriss’ concept of The Four Hour Workweek. Are there weeks where I put in less than 4 hours on this? Absolutely. But that’s not the norm. The norm is probably 20 hours, but there have been plenty of sixty hour weeks. Of course, now that there are three people working on it, things have improved. Cindy (a stay-at-home mother of four) came on board a couple of years ago to help me with ads and I get to concentrate on content. My wife is now an owner of the business as well. Not only does that give us another individual 401(k), but it also gives some additional help. She concentrates primarily on book sales and arranging speaking gigs. The initial time to get the site going really came from a unique aspect of emergency medicine. Because emergency docs work a lot of nights, weekends, and holidays, that left me with a lot of free weekday mornings when my wife was busy, my kids were in school, and my friends were at work. There are only so many solo mountain bike and ski days I could handle before finding something else to fill my time. And fill my time it did! How are you able to balance your time between running the White Coat Investor, being a physician, having a family and enjoying all your other hobbies? That is the greatest challenge of all. There is no doubt that both my wife and I are very busy between our four kids, all of our hobbies, our business, our volunteer activities, and my practice. Until the last few months, I’d been a full-time emergency physician (I recently cut back to 3/4 time, seeking that balance.) The last year or so I’ve been heavily focused on trying to figure out what my ideal life looks like and gradually molding my life so it looks like that. Now that the WCI provides enough income that I no longer need to practice at all, I’ve got to decide how much I want to practice. In reality, medicine is now a well-paid hobby for me. Without the WCI income, we’re technically not financially independent yet (we spend too much) but we’ll be there soon – much faster than our original plan which got us there in about ten more years. What are those hobbies or leisure activities? I enjoy the outdoors- cycling, mountain biking, skiing, rock climbing, hiking, canyoneering. I also play ice hockey and disc golf. I go on lots of trips, both with and without my family. I obviously put a lot of work into the site. However, much of that work simply goes towards advancing the first mission of the site – “helping those who wear the white coat get a fair shake on Wall Street.” For example, I do a fair amount of speaking gigs. With travel time, I may be gone two days to go speak in another city. I charge a fee, but it’s always less than I could have made staying home and working a couple of shifts in the emergency department. It’s pretty tough to get any group to pay you more than that. Writing additional posts (above and beyond the 950 I’ve written) may gradually increase readership down the road, which does impact income eventually, but for the most part it is unpaid work. Much of the income from the site is relatively passive, but it is stacked onto the very active, poorly paid work that has been done in the past and that I continue to do. I suspect if I quit writing and quit replying to emails or comments, there would be residual passive income for many years from the site. Perhaps half of what it makes would continue indefinitely. The book, The White Coat Investor, is a great example of passive income. Tons of work up front with the writing, editing, publishing, and marketing. But now I get a big fat royalty check every month. Totally passive now, but not in the beginning. Again, I kept practicing full-time until recently- it never made sense to spend time that I could spend seeing patients on developing passive income. But now the WCI income is actually higher than my practice income, and with a lot less risk and ongoing work. How has the income from the website and book impacted your family life? We’ll hit financial independence a little earlier than we otherwise would have. But all that income was stacked on top of a partner emergency physician income. We had plenty of income before the site ever made it big. In fact, we were millionaires BEFORE the site started making money. So I wouldn’t say it made a dramatic difference. We give more away. We invest more. We probably spend a little more. We bought a wake boat in 2015 that we probably would not have bought without the website income, at least not for another year or two. We’ll pay our house off sooner than we otherwise would. How do you feel about all the other sites that have popped up that have been inspired by you? Anything you would’ve done differently along the way? I would have said “No” to a lot of stuff that I now know didn’t work out well, but a lot of online entrepreneurship is trial and error. One tricky thing about developing passive income sources as a physician or other high income professional is that your active income pays so well. So it is usually best to do the passive income thing on the side at first and gradually move into it as you see success. In the end, it will be worth it, as it will allow you to practice medicine exactly how and how much you like. Many doctors have done this and they aren’t any smarter than you are.